Pandora's Birthday Party on Saturday, September 28th, 2013, from 9.30 am to 12.30 pm! All loving pet owners and their family are invited. Happy Birthday to the boss of Russell Vale Animal Clinic! If you thought I was talking about me, you are mistaken. 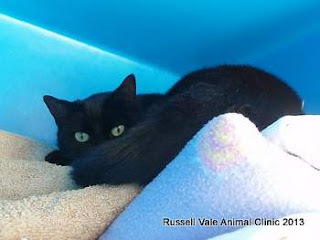 It is our clinic cat, Pandora. She turns the equivalent of "40" in September, and we are going to celebrate with a huge day! It is going to be awesome! It is going to be fun! Just wanted to share with you "The story of Pandora"..
Pandora arrived at our vet hospital on the 26th of October, 2006. She weighed 1.4 kg, and she had an attitude (in fact, she still does- have you been at the other end of her slinking up to you, asking for pats, and then getting a love bite?" She was found bedraggled in the gutter on the Princess Highway, in Woonona, and was brought in by a kindly Mrs Clarke for us to look after. She would hiss and spit at anyone who went near her for the first 4 days. We were lucky to get food and water to her with our skin on our hands attached. Dirk worked hard to gain her trust. And he still remains her favourite now. She loves to tease the dogs, she loves to sit at the front door, on either side, and she loves Dirk (our vet nurse). Paige at the 2012 Open Day! And it is for the kiddies - we are going to have a jumping castle, and a craft table, where we can make cat and dog toys. We supply the ingredients, and you supply the enthusiasm! And it is for the adults - they can enjoy some yummy food, watching their kids have fun on the jumping castle. NB Previously advertised dog wash is not running now, as we have the farmyard of baby animals instead! Please share, as we would love as many people to come along and have fun. Free Food, Free Drink, Free Jumping Castle Play, Tours of a working vet hospital, and some absolutely fantastic awesome competition prizes. Because we all love a good party, and we love family - thanks for being part of our animalclinic family. 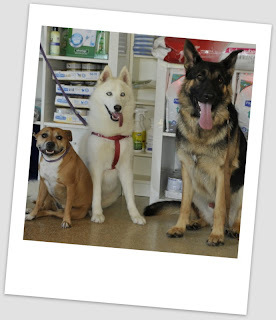 Just so you know who the team of Russell Vale Animal Clinic are, if you are new to the area and to us!